6 wires required from handset to gate for for operation of standard electric gates. The T-line doorphone features slimline design and excellent finish. The standard doorphones feature an auxiliary service button that can be used to operate other devices such as stairwell lights or automated gates. With the new T-line panel, design makes way even outside the building. Sophisticated and modern, the panel attracts attention firstly for its extra slim proportions: only 190 x 100 x 36 mm. The perfectly blended blue backlighting is an original solution for both the video and audio versions. Furthermore, the name tags are particularly large meaning that longer names can be written. 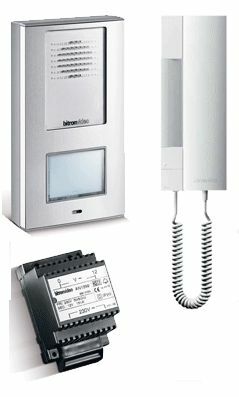 The panel may be easily wall-mounted or fitted on 100mm wide pillars. The best eCommerce software by ShopFactory powers P131. All-in one eCommerce and shopping cart software.